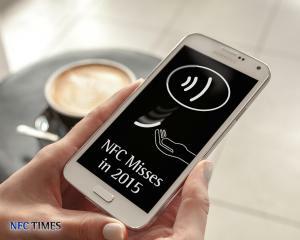 Top 10 Misses for NFC in 2015: SIM-Based NFC Falls Further; Apple Pay Expansion Comes Up Short | NFC Times – Near Field Communication and all contactless technology. In its second-annual Top 10 Misses of the Year, NFC Times found the continued decline of SIM-based NFC, problems for Apple in expanding Apple Pay beyond the U.S., tanking of the TSM business and the slow start to scheme-based tokenization, among other misses and disappointments for the industry. NFC Times Exclusive – While 2015 was arguably the year that saw the most important rollouts yet of NFC technology, led by Apple Pay, 2015, like past years, was marked by a number of disappointments and missed opportunities. With this article, NFC Times offers its second annual “Top 10 Misses of the Year” feature for NFC. We look at the projects that failed, the expected rollouts that didn’t happen, the budding trends that proved premature and the hype that went a little too far. (See table below). Among the key misses for 2015 was the continued decline of SIM-based NFC, the problems Apple has encountered in expanding Apple Pay beyond the U.S., the tanking of the TSM business and the slow start to scheme-based tokenization. The prospect for use of SIM cards to anchor broad rollouts of NFC applications, especially payment, was already in decline in 2014. But 2015 marked the beginning of the end of the technology as a viable option for banks and most other types of service providers to use to widely roll out secure applications. The closing of the Softcard wallet and the U.S. telco joint venture behind it at the end of March 2015 dealt a serious blow to the technology. Softcard, formerly known as Isis, was by far the largest rollout of SIM-based NFC to date. But poor take-up and the launch of Apple Pay in the U.S. convinced Softcard’s owners, Verizon Wireless, AT&T Mobility and T-Mobile USA, to end the project March 30 and sell out to Google. With the deal, Google is believed to have extracted a promise that the three telcos would preload its Android Pay app on certain Android phones they sell. Google also acquired Softcard’s SmartTap technology, which enables users to tap to pay and redeem offers and rewards in a single tap. Telcos in Canada and some European and Asian countries plod on with SIM-based NFC, including Vodafone and Orange groups in Europe, which mainly see SIMs as a vehicle for their prepaid payments services and anchors for their mobile wallets. Both launched expanded services in 2015, which they plan to continue in 2016. Chinese and Japanese telcos are also not finished with NFC SIMs, including China Mobile, which said in July that it would eventually have 100 million NFC SIMS on issue. But China Mobile had a disappointing 2.5 million or fewer “active” users of NFC-based services as of last summer. Vendor trade group Eurosmart projected in November that suppliers would ship 180 million NFC SIMs in 2015. While much lower than earlier projections, that still would represent a growth rate of 12.5%, compared with 2014. And the group forecasts vendors will ship another 200 million NFC SIMs in 2016, which would represent an increase of 10% from the previous year. That would be only half as large as the nearly 400 million embedded secure elements Eurosmart projects vendors will ship in 2016, however. The trade group does not specify which countries would take delivery of the NFC SIM shipments. The SIM-based projects from such telcos as Orange, Deutsche Telekom and China Mobile were much smaller than expected in 2015. And while these and some other telcos apparently plan to continue to take delivery of SIMs, other options for banks, such as Apple Pay, Samsung Pay and a range of host card emulation-based apps, indicate that any rollouts of SIM-based NFC service will be fragmented. At the same time, NFC SIM cards cost two to four times or more than conventional cards in most markets. It means that SIM-based NFC appears destined for smaller niche applications, which need a secure element but not a broad rollout of NFC SIMs. With its high-profile launch of Apple Pay in the U.S. in October of 2014, 2015 looked like it would be a year of international expansion for Apple's mobile payments service. After all, Apple Pay would give banks a user-friendly option to enable mobile payments for a sizable share of their customers. And Apple’s streamlined approach to provisioning applications would avoid the hassle that a number of major banks had experienced in the past in trying to bring customers onboard with mobile payment, usually with NFC SIMs. But as Apple sought to expand outside of its home base, it ran up against the hard realities of disparate banking markets in the various countries it was targeting. As NFC Times reported last spring, Apple’s prime target markets for expanding Apple Pay beyond the U.S. in 2015 were China, UK, Canada and Australia. All are either important smartphone markets or contactless-payment hotspots. But of those markets, Apple managed a full launch in only one country, the UK, in July. It had to make do with only one major issuer, American Express in Australia and Canada for launches in the fall. The deals cover only cards issued directly by AmEx, which account for a small percentage of total payment transactions in both countries. The main–and in some cases the only–reason for the pushback from banks against Apple Pay is Apple’s insistence on collecting a cut of transaction fees from issuers. The transaction fee cut is palatable in a market such as the U.S., where credit card interchange rates are relatively high and Apple’s smartphone market share is too big to ignore. Apple has also announced it would expand to Spain, Hong Kong and Singapore in 2016 with American Express. But as in Australia and Canada, AmEx represents only a small share of total card transactions. Apple announced it would launch Apple Pay in China in early 2016, though the tech giant probably had to cut fees to seal the deal. It is believed to have lowered its original asking price for fees in the UK and is expected to lower its fee cut in Australia, as well, to recruit banks there. Apple, which is used to rolling out devices and apps globally without having to negotiate deals market by market, may have to tinker, if not completely change, its business model if it continues to have problems expanding its payments service overseas. Strongly correlated to the gloomy prospects for SIM-based NFC are sagging fortunes of trusted service managers. Once a promising market, TSMs have fallen on hard times, and vendors have been retooling their TSM platforms to support host card emulation and tokenization. Gemalto, which is the largest TSM globally, has fallen the farthest. Most important among the vendor’s TSM contracts was that of the Softcard joint venture, which was in full rollout mode before it ended operations in March of 2015. Gemalto’s other TSM contracts have failed to yield much recurring revenue since they have seen low to near nonexistent volumes. The closing of Softcard alone has cost France-based Gemalto an estimated €30 million (US$32.6 million) in revenue per quarter, according to Gemalto CEO Olivier Piou, speaking to financial analysts last August. At that rate, the closing would cost the vendor nearly €100 million in lost sales in 2015 and around €50 million in profit for the year. A significant part of those losses are probably from lost sales of NFC SIM cards to the three Softcard telcos, not directly TSM revenue. Gemalto was operating the TSM service for Softcard out of a data center in Dallas, so would have received revenue for each SIM card loaded with payment cards. The vendor was also serving as a service provider TSM for JPMorgan Chase, one of the few issuers participating in the Softcard wallet. And the vendor operated a little-used service provider-TSM platform for Softcard itself. Gemalto has lost out on other TSM contracts that failed to scale up. These range from contracts with major telco groups Vodafone, Deutsche Telekom and Telecom Italia to TSM contracts on the service provider side for banking groups in Italy, Hong Kong and Taiwan. Piou last August seemed to suggest that Gemalto would cut back or even discontinue its TSM platform business if it ceased to be profitable or looked like it wouldn’t turn a profit in time to meet Gemalto’s 2017 profit goals. Mainstream TSM vendors are being hit not only by the failure of their projects to produce recurring revenue. They also face threats from host card emulation apps and payments services such as Apple Pay. HCE apps don’t require a TSM. And Apple uses its own TSM and those of such payments schemes as Visa and MasterCard. TSM vendors, such as Gemalto, say there is still a need for their TSMs for the remaining NFC SIM projects and also those using embedded secure elements, though this does not appear to be a sustainable business case. Like other mainstream TSMs, such as Oberthur Technologies, Giesecke & Devrient and Safran Morpho, Gemalto has been retooling its TSM technology to support host card emulation and tokenization. Gemalto struck a deal with Morocco-based payment software company HPS to provide it with part of the HCE and tokenization technology that Gemalto is now using for its new offers to banks. Germany-based Giesecke & Devrient, one of the early TSMs, appears to have pulled back from selling TSM services and instead is promoting its HCE offers. G&D is also believed to be building a tokenization solution. France-based Safran Morpho recently purchased HCE and wallet start-up Airtag, also of France. Morpho had purchased TSM pioneer Cassis International in 2012, but has seen relatively little contract revenue from the deal the past few years. Following its collaboration with Apple to develop issuer-side payment tokenization in time for the launch of Apple Pay, the major international payment schemes, such as Visa and MasterCard, believe they can turn tokenization into a service to keep their networks vital and perhaps pick up some additional revenue as payments move to mobile. But despite codifying their tokenization technology with their proprietary standards group, EMVCo, banks outside of the U.S. are not yet using scheme-based tokenization for their own mobile payments services using host card emulation. The tokens take the place of 16-digit primary account numbers, safeguarding the latter from fraudsters. Tokenization is considered essential for HCE rollouts, since the tokens are stored in generally unsecure phone memory. Apple is also using tokenization, provided by the schemes, in which Apple Pay stores payment credentials on an embedded secure element. Large banks that are commercially rolling out HCE technology outside of the U.S., such as Commonwealth Bank of Australia, the UK’s Barclaycard and Royal Bank of Canada, along with several smaller banks, are generally issuing their own tokens in the form of alternate PANs, sometimes called virtual cards. These are separate card account numbers linked to a parent account that are usable only in a certain domain, such as the mobile channel. The banks believe the alternate PANs enable them to retain more control over the transactions than handing over the tokenization service to major payments schemes. In addition, domestic debit schemes that handle a majority of the transactions in many countries, such as some of those in Europe, are building their own tokenization services. Visa and MasterCard had planned to charge for tokenization, but have agreed to waive the costs indefinitely. They’ve set up commercial tokenization programs, VDEP from Visa and Express from MasterCard, which they say would waive costs as long as issuers and token requesters used their services. Such token requesters as Google and Samsung have signed up for the services for their respective wallets. But other than these wallets, the schemes have not announced many users of their tokenization services. Two exceptions are large U.S. issuer Capital One, and United Overseas Bank of Singapore, both of which agreed to use scheme-based tokenization for their respective HCE-based wallet apps. Many other banks want to retain control of their own tokenization or allow a vendor or a local scheme to provide it. It hasn’t helped Visa and MasterCard that some industry observers, as well as vendors, believe these major international schemes are trying to lock banks into their networks by getting them to sign up for their tokenization services. The major schemes might later charge for tokenization, contend the vendors. Even if they don’t, the issuers would have to pay other fees, the vendors say. And six major schemes, including Visa, MasterCard and American Express, own EMVCo, which has been developing international specifications for tokenization, though has been late in updating them. To date, about the only token service providers using the EMVCo specs are the schemes themselves. Of course, some vendors are trying to steer customers away from scheme-based tokenization because the vendors have their own “solutions,” for which they plan to charge. These tokenization services would probably comply with the EMVCo specs. While EMVCo’s specifications will probably be used for tokenization by more and more issuers, it remains to be seen how much take-up the major schemes themselves get for their on-behalf-of tokenization offers. Despite the ability of transit riders in London to tap to pay fares with bank cards using Apple Pay, mobile NFC transit ticketing continues to disappoint. Most contactless transit-ticketing services use proprietary contactless technology, such as Mifare, and this requires a secure element and can’t support HCE, at least for now. This creates problems because transit authorities and fare-collection companies would have to do deals with the owners of the secure elements, such as telcos and their NFC SIMs or handset makers and their embedded secure elements. Transit agencies, which generally have lower margins than such service providers as banks, often do not want to pay fees to access these secure elements. Using secure elements also would require transit agencies to hire a TSM, not a welcome cost for the agencies. And there have been some technical problems in the past with implementation and rollout of over-the-air provisioning and management of the transit services with Mifare, the most popular technology used for contactless fare collection. This over-the-air provisioning service is called Mifare4Mobile. According to NXP, as of last July there were only 17 Mifare-based mobile transit ticketing projects using Mifare4Mobile, with 12 of those in Russian cities. None of the rollouts, which also include Dubai, Bangkok and Taipei, were believed to be sizable. A Mifare mobile-ticketing project proposed in Los Angeles by the Los Angeles Country Metropolitan Transit Authority appears to have been dropped because of the closing of the Softcard joint venture. LA Metro had counted on its customers to have NFC SIM cards in their handsets issued by the Softcard joint venture partners to store the Mifare applications. China was expected to be a hotbed for NFC transit-ticketing services. While a number of Chinese cities have launched or were planning to do so, mainly using NFC SIMs from telco China Telecom and China Mobile, the business case for the telcos is small or nonexistent. Internet payments players Alipay and Tencent Holdings were planning to enable transit ticketing from embedded chips in Android NFC phones, mainly those from Chinese OEMs. But they have lost interest, focusing instead on QR codes to enable retail payments at the physical point of sale. Some transit operators, including some in the U.S., are now not even considering NFC for their mobile ticketing apps and instead are using bar code or QR codes for their apps or are planning to do so. Chinese OEMs had been expected to follow Apple and Samsung in 2015 by enabling mobile-payments and ticketing services using embedded chips in their handsets. While they are supporting HCE payments by including NFC controllers in their devices, the handsets packing embedded secure elements, or eSEs, did not materialize as expected during the year. NXP, which hoped to be a prime supplier of the eSE chips, blamed the disappointing sales on delays in the expansion of Apple Pay in China. It remains to be seen whether the situation will change with the planned expansion of Apple Pay in China in the first quarter. This helped explain why NXP was predicting a rare drop in revenue in the business unit that supplies NFC chips, Secure Connected Devices. Revenue in the unit could fall in the high single digits to low double digits for the fourth quarter compared with the third quarter, NXP forecasted. As NFC Times reported in November, NXP has renewed its push for its “loader service,” which seeks to make it easier for service providers to load payment and other applications on the chip maker’s embedded secure elements by managing keys on the chip. NXP in 2014 had targeted the service at smartphone makers, especially smaller Chinese OEMs, that have little interest or ability to manage keys on embedded chips they might buy from NXP to support payment, transit ticketing and other applications for mobile wallets. Android handset manufacturers and brands in China, including Oppo Electronics, BBK Electronics, Meizu Technology, vivo Electronics and also Huawei Technologies had supported the loader in one or more models as of 2014. But demand dropped off. For example, Oppo-affiliated handset maker OnePlus kept NFC out of its Android-based OnePlus 2 smartphone altogether, after including it in the OnePlus 1. NXP says it believes Chinese OEMs plan to support NFC with embedded chips, perhaps in 2016, and the fact that Apple plans to launch Apple Pay in China early next year could give the smaller OEMs more incentive to enable mobile wallets from embedded chips in their Android devices. Despite broad support for NFC modem technology by OEMs in their devices and growing interest in mobile payments, 2015 was not kind to publicly traded companies with a strong NFC connection. Israel-based On Track Innovations and U.S.-based Identiv, both of which have encountered management problems, saw their shares plunge during the year. Shares for OTI, which makes contactless readers and licenses NFC technology, saw its share price sink by 73% for the year, trading at just $.45 per share at year’s end. Identiv, which makes NFC tags for gaming figurines, among other non-NFC markets including access control, fell even more, plummeting more than 85% for the year. Among other problems, it faces a securities fraud lawsuit. And shares of France-based Gemalto fell by nearly 20% for the year, with investors likely doubting the smart card and digital security vendor can hit its ambitious profit goals and wondering how much Gemalto will be hurt by the falling SIM card market. Gemalto, the world’s largest SIM card supplier, has been diversifying for years, but it is closely associated with SIM cards in the minds of many investors. And until it incorporated its acquisition of network security provider SafeNet to its books earlier this year, smart cards accounted for at least 80% of total revenue every quarter. Gemalto’s share price was trading at €55.27 (US$60.01) at the end of 2015, down 19% for the year. The current slide began in late August, after Gemalto CEO Piou estimated that the vendor was losing around €30 million revenue per quarter from the closing of Softcard. That was not the only reason for the fall in the share price, but it was unexpectedly large. Rival vendor Oberthur Technologies, whose venture capital owners had planned to float the company in 2015, abruptly cancelled the IPO in early November, claiming capital markets were not favorable at this time. That no doubt means Oberthur and its majority owner, Advent International, didn’t receive the interest it had expected from investors. Both Oberthur and Gemalto reported substantially higher revenue from sales of EMV banking cards to the U.S., but that has not buoyed investors. Finally, France-based Inside Secure, which has repositioned itself in the digital security market and away from supplying NFC modem chips, saw its share price fall by 60.8% for 2015, to close just over €1.00. Its former rival in the NFC chip market, NXP Semiconductors, the largest supplier of NFC chips globally, saw an increase in its share price of just 9.7% for 2015, though the stock had peaked at an all-time high of US$114 per share in June, it later fell back because of disappointing earnings in the third quarter. But NXP is involved in a number of other markets than just NFC, especially after acquiring Freescale Semiconductors this year. Almost a textbook example of the problems and challenges of SIM-based NFC, Norway's Valyou Wallet was years in the planning, but lasted only 13 months in operation before the partners on the project, Norway's largest telco and its biggest bank, pulled the plug. Requirements for users to swap out their SIMs and a scarcity of contactless point-of-sale terminals help seal the fate of the NFC wallet venture. The typical problems of rolling out payment on NFC SIMs, combined with delays in the local debit scheme, BankAxept, which controls 90% of card transactions, to support contactless–and refusal of other telcos to join–gave the Valyou wallet very little chance of success. Valyou closed down Nov. 30, after organizers announced to users the previous month that they would call it quits. The end came quickly, with the decision to shut down by Telenor and DNB even coming as a surprise to most Valyou staffers, confirmed sources. According to one source, even after a year of operation, Valyou only had around 2,000 users in total. Another source, connected directly to Valyou or its backers, confirmed to NFC Times that user numbers only made it into the low thousands. In addition to the hassle for users to swap out their SIMs in order to use the service, competitive issues made it unlikely that other telcos, such as No. 2 operator NetCom, owned by TeliaSonera, would join the project. With only one telco, Telenor, albeit one that controlled 50% of subscribers in Norway, Valyou had trouble attracting more service providers. And the limited number of service providers was not the only thing that no doubt put off many prospective users. The multistep process of enrolling for the service and activating cards in the Valyou wallet is also believed to have hurt user numbers. Other telcos besides Telenor and the Softcard JV partners have fallen short in trying to increase interest in their wallets. UK-based Vodafone Group in the spring of 2015 unveiled plans to use proxy-card technology as a way for Vodafone branch operators to enable subscribers to add more payment cards to their Vodafone Wallets. Users would directly enter their credit, debit or prepaid bank cards details into the Vodafone Wallet app. The ownership of the cards would be validated by Verified by Visa online authentication service. Users would also choose a wallet PIN for the bank card. The bank cards could then be used to fund NFC transactions conducted in stores by the separate prepaid proxy card, which would be issued by a small Vodafone partner bank. The telco would load the prepaid proxy cards onto its NFC SIM cards. The proxy card would be a separate prepaid application from the co-branded SmartPass NFC prepaid payment service that five Vodafone European branch operators–Spain, Germany, UK, Netherlands and Italy–have launched in their respective Vodafone Wallets. SmartPass mainly features a Visa payWave application loaded onto Vodafone SIMs, except in Italy, where it uses MasterCard PayPass. One or more of the Vodafone telcos have also deployed SmartPass on a passive sticker. Vodafone missed its deadline to enable at least one of its European branch operators to launch the proxy-card service by the end of the second quarter. While Vodafone telcos in at least a few of the five branch markets were promising subscribers they would be adding more cards, 2015 saw few if any of the branches make use of the proxy card technology. And when they do, it seems unlikely to add much oxygen to the telco wallet concept for Vodafone or other telcos. The proxy card still requires telcos to issue new SIMs and to convince their users to swap their old cards for the new ones, while offering a not-so- compelling use case as compared with cards. After Japan's telcos agreed to migrate to standard NFC from related but proprietary FeliCa three years ago, they began issuing NFC SIMs and ordering hybrid NFC-FeliCa handsets. But there were few merchant locations that could accept standard NFC payments. MasterCard added a big boost in mid-2013 by pledging to help roll out 410,000 terminals that could accept its contactless technology over the following three years. But as of the end of 2015, there was little change in the NFC acceptance infrastructure from 2013 that had numbered fewer than 1,000 for standard contactless point-of-sale terminals. These are terminals accepting applications supporting what is known as types A or B technology of the international contactless standard, ISO/IEC 14443, such as MasterCard Contactless and Visa payWave. On the other hand, there are more than 1.5 million terminals accepting proprietary FeliCa applications, such as the Suica transit and retail stored-value purse, DoCoMo’s iD mobile credit card brand and the Edy e-purse. But these services are restricted to Japan. Standard NFC modem chips in smartphones also support FeliCa technology. But they cannot be used at proprietary FeliCa terminals distributed through Japan in stores, transit gates and vending machines. UPDATE: MasterCard said the 410,000 MasterCard contactless terminals would be deployed by domestic card companies including Mitsubishi UFJ NICOS, Sumitomo Mitsui Card, Orient Corporation and UC Card. But in the end, acquirers had no obligation to enable MasterCard Contactless or other type A or B applications, and retailers haven't seen a business case. END UPDATE. But that has not happened, and this gives issuers little incentive to roll out cards or applications for the NFC SIMs that Japanese telcos continued to buy and issue in 2014 and, presumably, also in 2015. In addition, expanding to standard NFC and type A and B would lower costs for contactless POS terminals and expand the types of applications that service providers could offer. The telcos have also been rolling out millions of hybrid FeliCa/NFC phones that can accept the NFC SIMs, with nearly 150 models available as of last summer. These hybrid models would help Japanese subscribers use their phones when they roam overseas. But there appears to be commercial issues preventing the expansion to standard NFC applications at home. Not that No. 1 telco NTT DoCoMo, which led the FeliCa wallet phone rollout more than 10 years ago, was wholeheartedly pushing standard NFC. DoCoMo has its own payment service and mobile payment acceptance brand, iD, based on FeliCa. It has agreed, though, to go along with the transition by issuing NFC SIMs, buying hybrid NFC and FeliCa phones and hiring a TSMin France-based Gemalto. But besides a few small NFC payments projects and NFC-based airline boarding passes, the economics do not appear to have yet materialized to move Japan fully on the road to standard NFC services. © NFC Times and Forthwrite Media. NFC Times content is for individual use and cannot be copied or distributed without the express permission of the publisher.